I've been working SUPER hard on prepping homemade lunches this summer as I coach our mamas through their own home workouts and meal prep goals in the 8-Week Mama Reset program, but I will admit I was in a bit of a rut. Quinoa. Chicken. Spinach. Quinoa. Chicken. Oooo! Arugula. Quinoa. Chicken. Then this little bowl came along and rocked my world and I ate it four days in a row. Noodles have always been a super scarf-able food for me, something I don't have great willpower with and tend to reserve for restaurant meals or occasional pasta night family dinners. They're basically my favourite thing ever. I just don't have an "off" switch when it comes to noodles and pasta. Especially in the evening when I'm tired and craving ALL the carbs. I can eat so. much. pasta. And end up feeling not. so. great. But having noodles for lunch? BAM. Hitting that noodle sweet spot. Making me feel like I get to eat some comfort food I love. And somehow not binge-inducing like it can be at night. 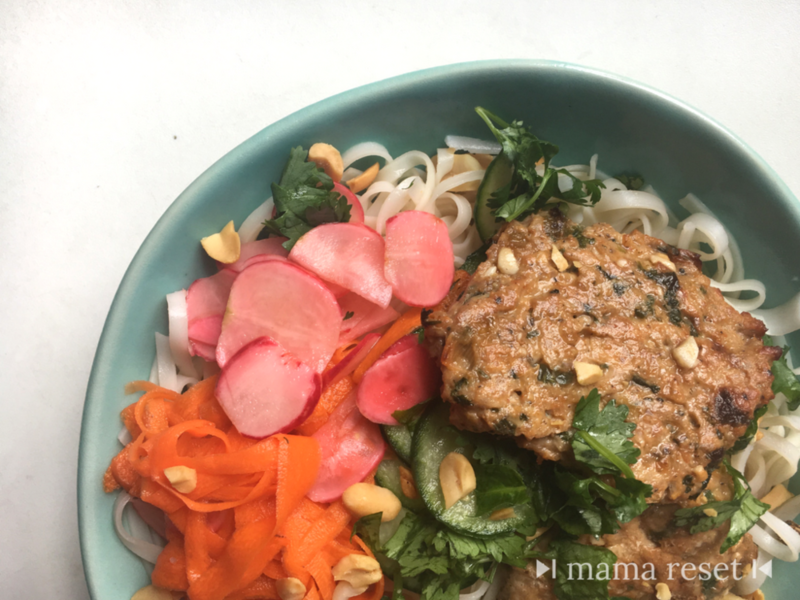 OK, so if you too would like a little more noodle action in your life, in a way that's healthful and fun, this is going to be your NEW FAVE RECIPE. We've lightened up these bowls by using ground turkey instead of pork and baking the patties instead of frying. Since it's a big batch recipe you'll spend no extra time but still have plenty for a fun dinner and leftovers for lunch, or several ready-to-go lunches for you and your brood. Feel free to substitute soba, brown rice or other noodles to your taste! Before you head out shopping this weekend, grab this delicious Bahn Mi in a bowl recipe! Prep the components in advance, then toss them together each day to make a super Instagram-worthy, jealousy-inducing lunch. Click here to get the recipe & printable just like the ones included in the Mama Reset online program! Hope you love it as much as I do! And make sure you tag me @bellybootcamp when you make it because I KNOW you're going to love it!